Ready or not, winter is here – and it’s bringing with it the blowing snow, frigid winds, and freezing rain Canada has come to expect. For contractors working outside, winter can be an especially challenging season. Built-up ice and snow can pose serious safety hazards on the jobsite, while polar temperatures can put the health of crew members at risk. 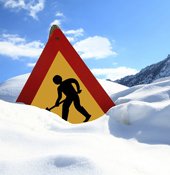 Winter can be hard for any worker exposed to nature’s elements for an extended period of time. Remember, it only takes a moderate amount of wind to make -5˚C feel like -12˚C. Hypothermia and frostbite, both caused by a decrease in body temperature, can be life threating if not caught early. Any worker displaying associated symptoms (loss of muscle control, nausea, fatigue, lightheadedness, confusion, or excessive sweating) needs to be treated urgently. Trench foot occurs when feet are exposed to damp, cold conditions for a prolonged period of time. Chilblains are the painful inflammation of tiny blood vessels, which happen when skin is repeatedly exposed to cold (not necessarily freezing) air. They lead to the formation of red, itchy patches, though symptoms will usually calm down after a few weeks or if the weather warms. The National Institute for Health and Safety (NIOSH) recommends workers dress in loose, warm layers to encourage proper blood flow. They should also cover vulnerable extremities (feet, hands, heads, and ears) with warm socks, boots, gloves, and hats to keep the cold from getting in. If outdoor work can’t be postponed until it gets warmer, make sure workers have a dry and heated place to rest. You might also need to consider calling on more crew members for shorter periods of time and brushing up on training to make sure people know how to counter the effects of cold-related stressors on their bodies. Fall protection is a major concern year round, but accumulated ice and snow throughout the winter can make that task even more important. Wear the right footwear with thick, grippy bottoms for enhanced traction. Walk slower, taking short steps and adopting a smaller gait, to maintain your balance. If someone needs to shovel snow, make sure they know how. They should always bend at the knee, keep their back straight, and avoid overloading the shovel of twisting when throwing. Concrete: To set to the right strength, concrete can’t be allowed to freeze for the first 24 hours after being poured and placed. Sheeting can sometimes be used if it isn’t too cold, though be prepared that you might need to use additional heating systems if it’s particularly chilly. Masonry: The same cautions outlined for concrete apply to masonry as well. Mortar mix prepared or left in the cold simply won’t perform properly. Drywall: The issues here are about quality not safety. Drywall mud requires a long time to set up and dry. It can take days if the conditions are poor, which can cause setbacks for your job. Paint: Low temperatures can lead to more significant issues down the road like mildew and mold. Letting paint dry in the cold will also reduce its life expectancy. You should always read and follow your manufacturer’s guidelines for any products you’re using to get the best results. Practice bad-weather handling in open areas like parking lots. Stock emergency items (flashlights, flares, shovels, blankets, etc.). Know and stick to vehicle-specific temperature warnings. Know the limits and avoid conditions that are too hazardous. Continue to inspect vehicles routinely to confirm they’re working as they should. Winter can be an equally challenging time for your power tools. The cold weather can cause a host of problems including cracked cords, motors that won’t start, and batteries that unexpectedly die (just to name a few). Use the right oil suited for the cold and your tool (as per manufacturer guidelines). You might need to consider localized heating sources if it gets cold enough. Don’t keep compressors inside with lines running out. Doing that can cause frost to form in the hoses and lead to blockages. Leave cords in fixed locations, especially main lines, to minimize the amount of stress placed on them. Store tools properly. Keep in mind that you’ll need to give tools time to acclimatize to major temperature changes, whether you store them somewhere warm and work somewhere cold or vice versa. 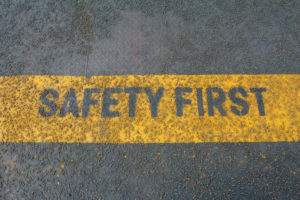 Following these tips and taking all necessary precautions will help keep everyone and everything on your jobsite prepared, warm, and safe during these cold months. Fastening House has the supplies you need – including cold-weather wear, shovels, de-icers, extension cords, and more – to keep your jobsite functioning at its best throughout the winter. Contact us today to discuss your needs! Welcome to Fastening House’s New Website! Happy Holidays from Fastening House! Bruce has over two decades of experience helping businesses grow and develop with customers in mind. His client-focused approach lets him work across teams to ensure success for Fastening House and the contractors they serve. Welcome to Fastening House’s blog. It’s your source for keeping up to date with the latest industry trends, best practices, tips and tricks, and product news, as well as all the updates from Fastening House. Is there a specific topic or question you’d like us to address? Get in touch today to let us know!